Please feel free to contact National Powersport Auctions Corporate office or any of the locations to have your questions answered to obtain additional information. Our friendly staff of powersport professionals can assist with every step of the auction process. NPA Special Rate: $80.00 for one King bed. $85.00 for two Double beds. NPA Special Rate:Contact Kimmy Bui Lee and mention NPA for discounted rate. One King bed or two Double beds. Breakfast Included. NPA Special Rate: $119.00 for a Standard room. NPA Special Rate: $89.00, King bed or two Queen beds. NPA Special Rate: $89.00 - Friday-Saturday. $129.00 Sunday-Thursday. Breakfast Included. NPA Special Rate: $89.00 Friday-Saturday. $119 Sunday-Thursday. Breakfast Included. Ask for a Business Traveler Rate or AAA Rate if applicable. NPA Special Rate: $99.00 for Standard room, choice of one King or two Queen beds - Thursday-Saturday. Breakfast Included. AAA - 10% Off. NPA Special Rate: $139 for Standard room. NPA Special Rate: $84.00 King or 2 Queen Beds. NPA Special Rate: $152 for a Standard Room. Breakfast Included. National Powersport Auctions is the number one provider of auction and remarketing services in the powersports industry. 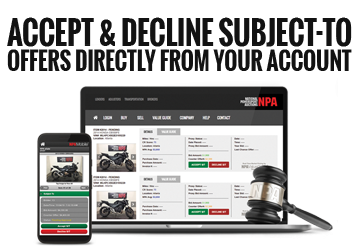 Created in 1990 by founders from the industry, NPA serves lenders and dealers throughout the nation with a complete range of auction-related services. We realize we play an important role in the growth and profitability of all our customers, and we are dedicated to providing them with the tools and first-class service they need to be successful. By clicking LOGIN you accept our Terms & Conditions. Register your dealership with National Powersport Auctions to access our various auction events. We offer registered dealers, exclusive access to thousands of powersport vehicles at our five monthly auctions. National Powersport Auctions is a nationwide company that has been serving the powersport industry since 1990. Founded by dealers, for dealers, we understand the challenges of maintaining a successful dealership. NEED ANSWERS? WE ARE HERE TO HELP. National Powersport Auctions realizes we play an important role in the growth and profitability of all our clients and affiliates, and we are dedicatd to providing the tools and first class service needed to be successful. Global Search allows dealers to find vehicles from all live auctions, exchanges and online platforms and displays them on one page. Simply enter any year, make, model or VIN and Global Search shows you all related vehicles.